A sensational viola player taught by Jordi Savall, a master of the lute born amongst the dervishes of Damas and a percussionist who is passionate about spirituality: three musicians pool their talents to immerse us in a mystical and poetic musical universe. The melodies of Marin Marais or Sainte-Colombe intermingle with the exotic notes of the khanoun, the oud and the reed flute. Through the sheer beauty of the melodies and the sacred texts, this unique experience transports us to the very source of the great spiritual Ways. The words of the Fathers of the desert, of the mystical medieval Christians, of the great Rumi and of Mansur al-Hallaj take on their full meaning. Let us allow our hearts to become firebirds, drunk on the nectar of the gods! A sublime meeting of Baroque, Arabic and Ottoman music with great, inspired poets. 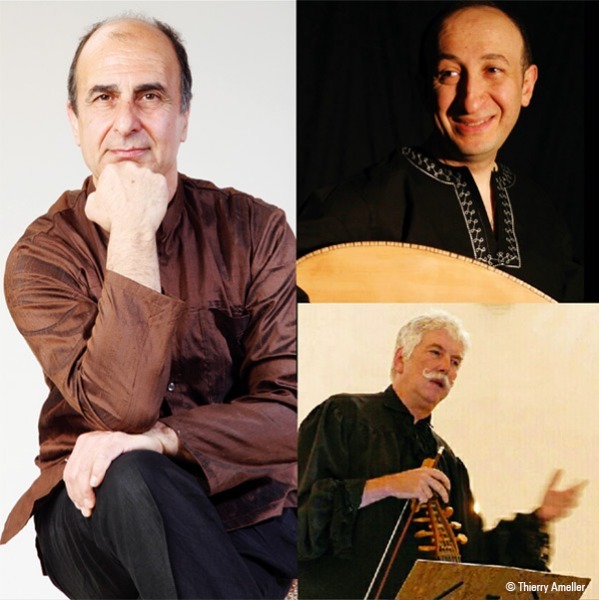 A divine concert where Oriental mysticism meets its Western counterpart! Lecture: The sacred music of the world: a planetary odyssey by Gerard Kurkdjian (author of Grand Livre des Musiques Sacrées du Monde - Albin Michel 2016). Session of guided musical meditation with Gerard Kurkdjian.